Nine out of ten millennial renters want to purchase a home, but few plan to do so in the near term. Of those who say that they plan to purchase a home, just 4.9 percent say that they will do so within the next year, while 34 percent expect to wait five years or more. 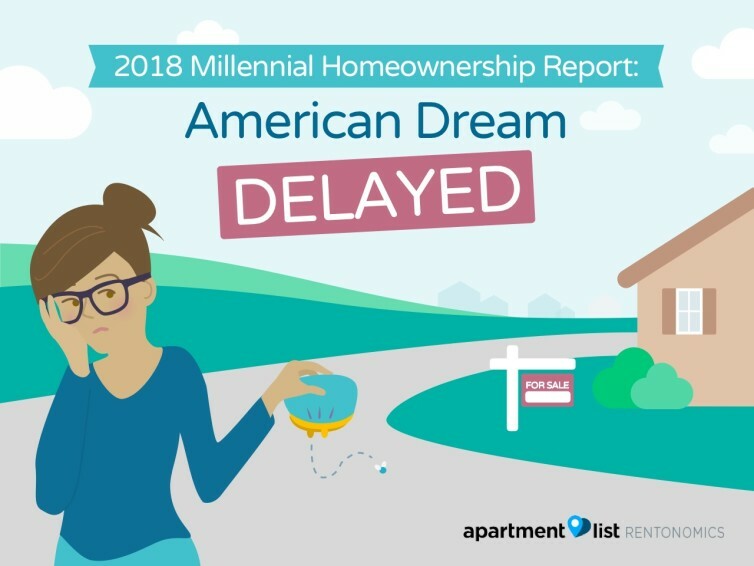 72 percent of millennial renters who plan to purchase a home cite affordability as a reason that they are delaying homeownership, with 62 percent pinpointing a lack of down payment savings specifically. 48 percent of millennial renters have zero down payment savings, while just 11 percent have saved $10,000 or more. We analyze millennial saving rates to estimate that two-thirds of millennial renters would require at least two decades to save enough for a 20 percent down payment on a median-priced condo in their market. Just 11 percent would be able to amass a 20 percent down payment within the next five years. Student debt is keeping homeownership out of reach for many millennials. We estimate that 23 percent of college graduates without student debt can save enough for a down payment within the next five years, compared to just 12 percent of college graduates who are currently paying off student loans. That said, those without a college education fare worst, with just six percent able to save a down payment within five years. Down payment help from family can make homeownership more attainable, but this benefit accrues primarily to the highest earners. 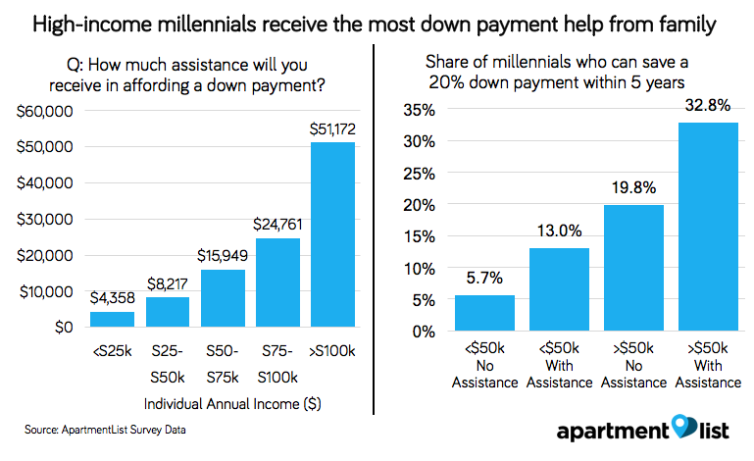 Of millennial renters who expect to receive assistance with a down payment, those with incomes over $100,000 per year expect to receive $51,172 on average, which is over ten times the average expected assistance of $4,358 for those making less than $25,000. Millennials are on the verge of surpassing Baby Boomers as the nation’s largest generation, and as such, this broad and diverse swath of the population will play a pivotal role in the fate of the American economy. Compared to previous generations, though, millennials are delaying many of the traditional markers of adulthood, and the question of when and if millennials will purchase homes looms large over the housing market. Despite recent increases, the millennial homeownership rate still significantly lags that of previous generations at a similar age. Several long-term macroeconomic trends have made homeownership a difficult goal for millennials to attain. Much of the generation came of age during or in the aftermath of the Great Recession, resulting in limited opportunities and stagnant wage growth in the crucial early stages of millennials’ careers. Many millennials have also seen large student debt burdens eat up the portion of their paychecks that may otherwise have gone towards down payment savings. Meanwhile, construction of new single-family homes has lagged significantly in recent years, leading to a severe shortage of starter home inventory for millennials looking to buy. In order to shed light on this important issue, Apartment List surveyed 6,400 millennial renters on their plans for homeownership. While the overwhelming majority of those surveyed would like to purchase a home at some point in the future, far fewer are financially prepared to do so in the near term. Among those who would like to own a home, 48 percent have nothing saved for a down payment, and we project that two-thirds would require more than two decades to save a 20 percent down payment based on their current savings rates. 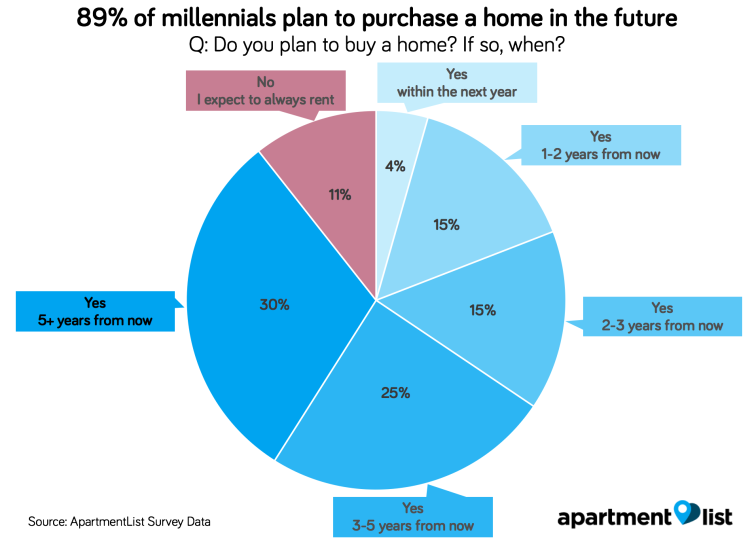 Our survey shows that homeownership is still a goal that the vast majority of millennial renters aspire to, with 89.4 percent of respondents saying that they plan to purchase a home at some point in the future. That said, the share who expect to always rent has been on the rise in our survey,1 and compared to prior generations, millennials are less likely to view homeownership as central to the American Dream. Furthermore, for many millennials, homeownership seems to be an aspirational goal rather than an imminent plan. Just 4.4 percent expect to purchase a home within the next year, while 30.4 percent say that won’t buy for at least five years. Among those millennial renters who plan to eventually purchase a home, 71.5 percent cite affordability as a reason that they have yet to do so. 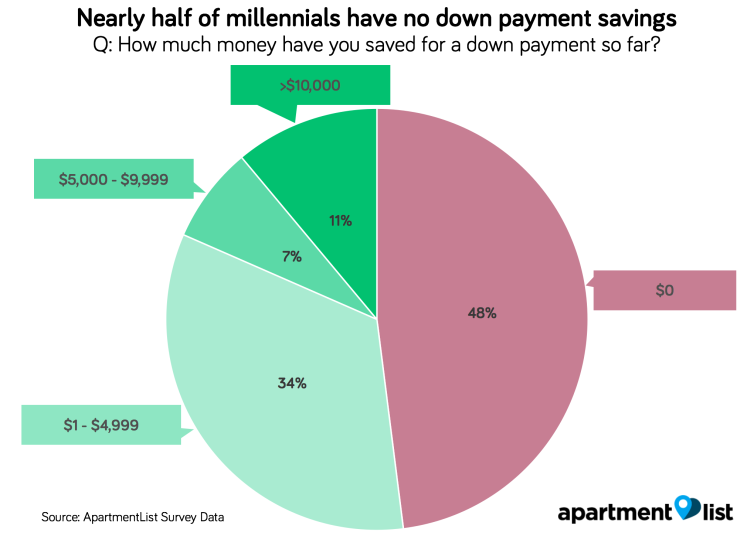 Specifically, we find that saving a down payment is the primary financial obstacle keeping millennial renters from purchasing homes, with 61.7 percent of respondents who plan to buy saying that they can’t afford a down payment. Meanwhile, just 29.1 percent say that they can’t afford a monthly mortgage payment, indicating that programs offering down payment assistance could have the potential to put homeownership within reach for a large share of millennial renters. To this end, several startups are prototyping new models of down-payment assistance, targeting millennials in particular. 37.7 percent of respondents cite concerns with their credit scores, a larger share than those who say that they can’t afford a monthly mortgage payment. Notably, this factor varies considerably by race and education. Just 15.8 percent of Asian respondents are worried about credit, compared to a staggering 58.5 percent of black respondents. Similarly, credit poses an obstacle for 51.0 percent of those with less than a Bachelor’s degree, but just 19.4 percent of those with a Bachelor’s degree or higher. That said, financial obstacles aside, many millennial renters simply don’t want to be tied down by homeownership in the near-term. 34.0 percent say that they aren’t yet ready to settle down in their current city, while 28.1 percent say that they want to get married or find a long-term partner before buying a home. These figures suggest that a preference for flexibility is also playing a role in millennials delaying homeownership. 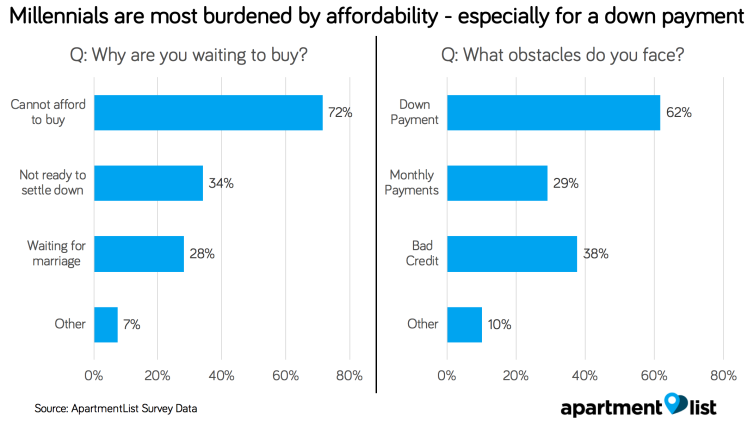 The extent to which amassing a down payment poses an obstacle to prospective millennial homebuyers becomes even more clear when we ask our survey respondents about their current savings levels. 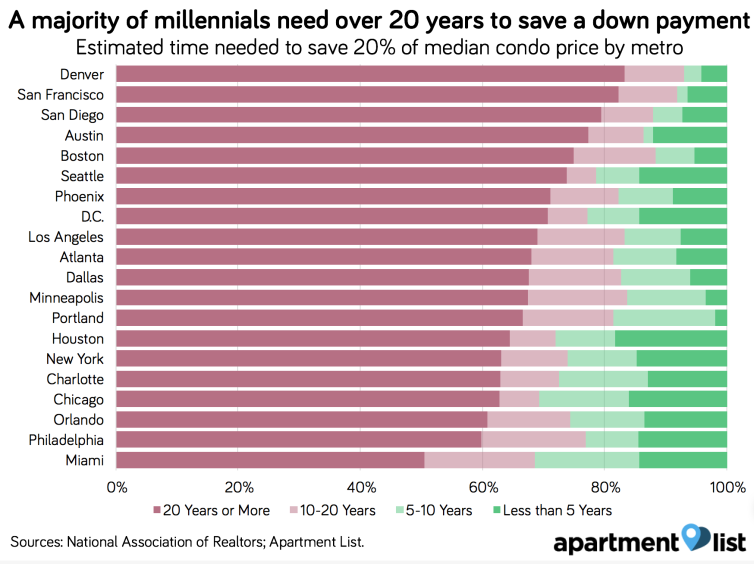 Nationally, the median-priced condo costs $244,100, meaning that $48,820 would be required for a traditional 20 percent down payment.3 However, just 11.1 percent of millennials have saved more than $10,000 for a down payment, while an astounding 48.0 percent have saved nothing at all. We also ask about respondents’ ongoing monthly savings rates and find that 43.3 percent are putting none of their monthly income toward down payment savings. This lack of savings shows that while most millennials would like to buy homes, very few are able to make the financial strides necessary to turn that hope into a reality. Furthermore, many millennials may be underestimating the amount they will need to save for a down payment. In the San Francisco metro, the nation’s priciest market, the average survey respondent expects to need $99,300 for a down payment. While attaining that level of savings is surely daunting for all but the highest earners, a 20 percent down payment on a median-priced condo in the San Francisco metro requires the much larger sum of $175,180. 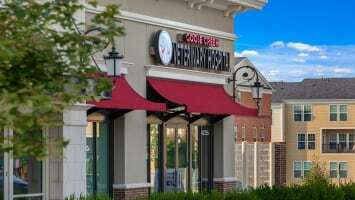 We see this trend even in more affordable markets. In Phoenix, for example, a 20 percent down payment on the median-priced condo amounts to $33,400, but our survey respondents in the area expect to need $17,610, on average. These disparities mean that many millennials may be planning to put down less than 20 percent, potentially resulting in added costs from higher interest rates and mortgage insurance premiums. Respondents could also be expecting to purchase homes that are priced well below the median in their areas, likely a difficult prospect given the current lack of starter home inventory in most markets. Alternately, some millennials may be planning to move to a lower-cost metro when it comes time to buy a home, but finding a balance between housing affordability and economic opportunity could prove difficult. 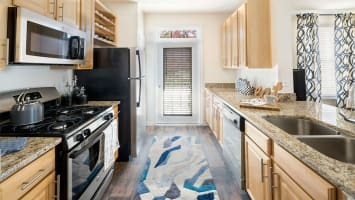 Overall, we estimate that just 11.0 percent of millennials who plan to purchase homes will be able to save enough for a 20 percent down payment within the next 5 years, while roughly two-thirds would require more than two decades to save a sufficient amount, effectively putting homeownership out of reach entirely. Millennials in the nation’s most expensive markets fare worst. 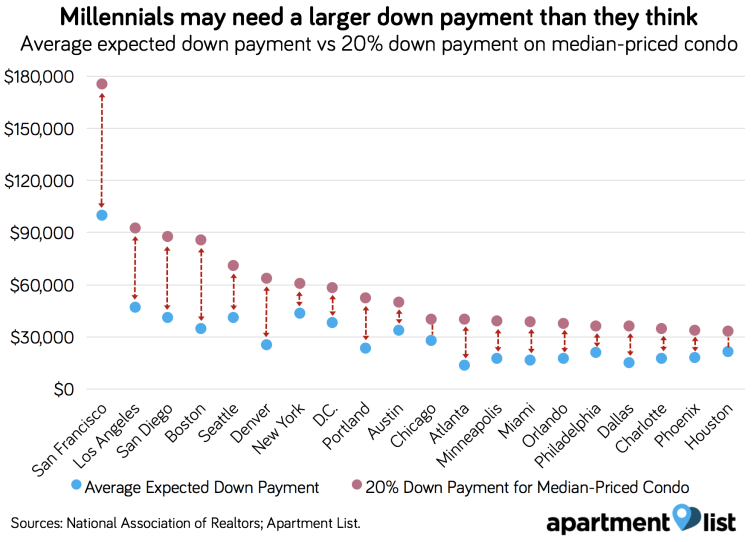 For example, we estimate that 82.3 percent of millennials in the San Francisco metro require more than 20 years to save a 20 percent down payment. That said, the situation is dire even in more affordable locations. In each of the metros we analyzed, we estimate that fewer than half of millennials will have a 20 percent down payment saved before 2038. For many millennials who aspire to own homes, the struggle to amass down payment savings is exacerbated by the burden of student loan debt. A study last year by the Federal Reserve Bank of New York found that over just the past decade, total outstanding student loan debt in the U.S. increased by 170 percent, while the average debt burden of students graduating with loans increased by 70 percent, to $34,000. While millennials aspire to homeownership at nearly equal rates across these three groups,5 we observe sharp divides in financial preparedness. The average current down payment savings of debt-free millennial college graduates is nearly three times larger than that of their debt-burdened counterparts.6 Similarly, college-educated millennials without debt are putting away more of their monthly paychecks toward saving for a down payment. Those without a bachelor’s degree are saving least, with average cumulative savings of less than half that of debt-burdened college grads. As a result, our analysis shows that those with student loan debt will be significantly delayed in their ability to purchase a home. We estimate that 22.8 percent of college graduates without student debt will be able to save a 20 percent down payment within the next five years, compared to 12.1 percent of college graduates who are repaying student loans, and just 6.2 percent of those without a four-year degree. As evinced by our survey, securing a down payment presents more of a financial barrier to homeownership than do monthly mortgage payments; therefore, millennials may turn to family for assistance in overcoming this hurdle. We asked survey respondents how much financial support they expect to receive toward a down payment and found that 19.4 percent expect some amount of help. While this share remains consistent regardless of respondents’ individual incomes, the amount of assistance varies substantially. Among respondents with an annual income over $100,000 who anticipate familial help with a down payment, the average expected level of support is over $50,000, enough for a 20 percent down payment on the national median condo price. This is more than twice the expected down payment assistance of those making between $50,000 and 75,000, and over ten times that of those making less than $25,000, who expect to receive $4,358 on average.7 This finding highlights the chronic nature of wealth inequality — not only do lower-income millennials have less purchasing power themselves, but their families have less support to offer. We find that when it is available, familial down payment assistance can put homeownership much closer in reach. Among millennials earning more than $50,000 and expecting help with a down payment, we estimate that 32.8 percent will be able to acquire a 20 percent down payment within the next five years, compared to 19.8 of those with similar earnings but no expected down payment assistance. Among those earning less than $50,000, the prospects are notably worse, but those who expect down payment help still see a significant step up compared to those expecting no help. While help from family can make homeownership a more attainable goal, this option is available to a minority of millennials, with the largest benefits accruing to those earning the highest incomes. For most American homeowners, their house is their largest financial asset, and homeownership has long been the key source of wealth creation for many American families. While the overwhelming majority of millennial renters still value homeownership, most face significant financial hurdles in turning that goal into a reality, with down payment savings posing the largest obstacle. We estimate that nearly half of millennials have zero down payment savings, and that two-thirds would require more than two decades to save a 20 percent down payment based on their current savings rates. 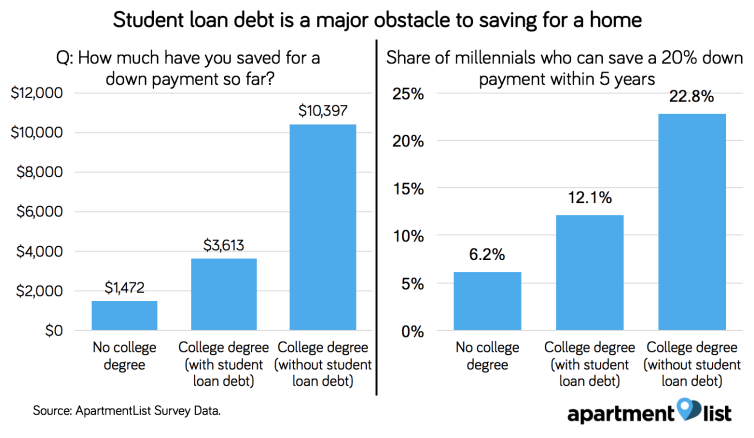 Student debt makes saving even more difficult for many millennials, although it is those without college degrees who face the toughest prospects in being able to afford a home. Down payment help from family can make homeownership more attainable, but this benefit accrues primarily to the highest earners. These findings speak to the difficult economic circumstances many millennials find themselves in. Stagnant wage growth in the face of rapid home price appreciation has made owning a home a far loftier goal than it once was, while large student debt burdens and a lack of high-paying job opportunities for those without college degrees exacerbate these affordability struggles. Given these trends, it seems that for many millennials, the dream of homeownership will continue to loom on the horizon, frustratingly beyond reach. Due to changes in methodology, this figure is not directly comparable across prior years of our survey. That said, we are able to make a broad directional comparison showing an increase in the share who plan to always rent. The share of respondents who say that they plan to always rent is 14.0 percent among those whose highest level of education is a high school diploma or GED, and 25.9 percent among those without a high school diploma. 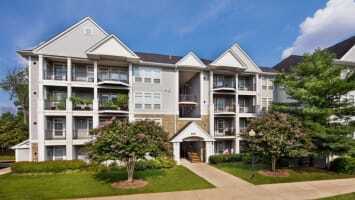 We use median condo prices published by the National Association of Realtors as a proxy for starter home prices. Our calculation assumes that home prices will increase at the historic national average growth rate over the past 20 years. We make a similar assumption for wage increases and assume that as their incomes grow, renters will continue put the same percentage toward down payment savings, although we do not account for increases in wages due to experience gained. Finally, we assume that renters will earn a return on their savings equal to the average growth of the S&P 500 over the past 20 years. 93 percent of college-educated, debt-free respondents plan to buy a home in the future; that figure drops only slightly to 91 percent among those repaying debt, while 88 percent of those with less than bachelor’s degree plan to purchase a home. Average down payment savings is calculated as the mean value across all respondents, omitting 1 percent outliers from both ends of the distribution. Average expected down payment assistance is calculated as the mean value across all respondents who report a non-zero level of expected down payment assistance, omitting 1 percent outliers from both ends of the distribution. Rob is a research associate at Apartment List, where he investigates trends in the housing and rental markets. Previously he worked in public health policy, and before that, graduated from UCLA with a degree in Globalization.